In the 1970s, when the first generation karaoke machines were launched in the market, music fans and wannabe singers all over the globe had a reason to celebrate. Avid, amateur singers greatly benefited from the Japanese invention as it provided them with full-orchestral music and they could also see the lyrics on-screen, which was immensely convenient. Today, karaoke remains one of the most popular music entertainment systems and it is fascinating to learn how the machines work and provide entertainment. Read on to know everything about karaoke machines. The karaoke entertainment system enables just about anyone to perform in complete synchronization with pre-recorded music or a video. The best part about the machines is that they also display lyrics of the song on the screen not just in English, but in a variety of languages. You can hook these machines to a computer or a television set. The translation of the word ‘karaoke’ is ‘empty orchestra’. Japanese words ‘kara’ (empty) and ‘oke’, which is the part of another Japanese word ‘okesutora’ (orchestra). Karaoke machines gained immense popularity all over Asia after they were invented and gradually spread out to other parts of the world including United States and other countries in the West. 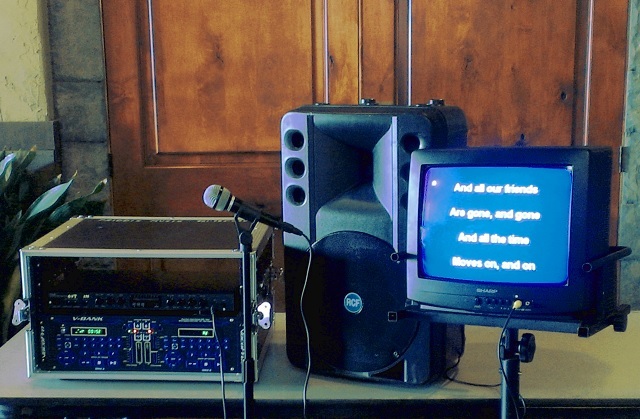 The simple and modern day karaoke systems comprise of some basic features, which include speakers, music players with either CD, DVD or computer compatibility, multiple microphone inputs, a cordless or wired microphone, voice pitch-altering capability and background music. Not only are the machines compatible with downloaded music, the state-of-the-art machines can also operate on other formats including VCD, DVD, laser disk or CD-G formats. You have the option of purchasing all components of the karaoke machine separately or can also buy an all-in-one single karaoke package if your budget allows. You can look at some of karaoke machine reviews and learn more about features of the best karaoke machines available. There is an audio input and output in karaoke machines and they also comprise of an in-built system for altering the pitch and tone of the music that’s played. In this way, the system is able to make adjustments according to the vocal range of the singer and enables them to perform in a key they are comfortable with. Basically, the original singer’s pre-recorded track is suppressed by the karaoke machine. Only the background music and the video of the soundtrack continues to play. Therefore, whenever a singer wishes to perform with the help of a karaoke machine, they are provided with lyrics on-screen and they can sing in sync with music in the background. There are a wide variety of benefits associated with karaoke machines. They are an interactive and exciting music medium, which provide assistance to amateur singers in perfecting their singing skills. They also create a music-filled vibrant ambience wherever they are used. However, the best perk of karaoke machines is their portability as they can be taken just about anywhere. It is also quite versatile because you can set up a karaoke machine easily in any part of the house and allow guests to join in the fun and singing. They can offer a high entertainment value to everyone.